06 February 1943: Keel laid by the Dravo Corp., Wilmington, Del. 161k Lucius Allyn Bostwick was born on 21 February 1869 in Providence, R.I. He graduated from the Naval Academy on 06 June 1890 and served in Newark (C-1), Philadelphia (C-4), Alert, and Monterey (M6) before reporting to the Naval War College and Torpedo School in November 1895. He returned to sea on board Ericsson (TB 2) and then was assigned to Oregon (BB 3). While on boardOregon, he saw action off Santiago, Cuba, during the Spanish-American War. Detached from Oregon in January 1900, he served briefly in Solace (AH 2), Indiana (BB 1) and Iowa (BB 4) before attending the Naval War College in 1904. Upon graduation, Lcdr. Bostwick reported to Brooklyn (ACR 3) as navigator for two months before reporting to Tacoma (C 18) as executive officer for four years. Bostwick served as aide to the commandant and as inspection officer for the Norfolk Navy Yard during 1911 and 1912. Detached from there in October 1912, he reported to South Carolina (BB 26) as XO, then to Montana (ACR 13) as temporary CO. In January 1914, he commanded Nashville (P G7) and cruised the West Indies and along the Central American coast. In October 1914, Bostwick was detached and reported to Washington DC for duty with the Navy Department's General Board. In 1917, after the United States had entered World War I on the side of the Allies, Capt. Bostwick returned to sea as CO of South Dakota (ACR 9), escorting convoys of troop and supply ships, for which he received the Navy Cross. After briefly commanding New Mexico (BB 40), he served as senior member of the Naval Overseas Transportation Service Demobilization Board in New York and as a member of the Joint Board of Review for the Demobilization of Troop Transports. That duty completed in September, Capt. Bostwick returned to Washington, D.C., for duty as assistant to the Chief of Naval Operations. From August 1922 to June 1923, he commanded California (BB 44), becoming Rear Admiral Bostwick and earning his next position, chief of staff to the Commander in Chief, Battle Fleet. 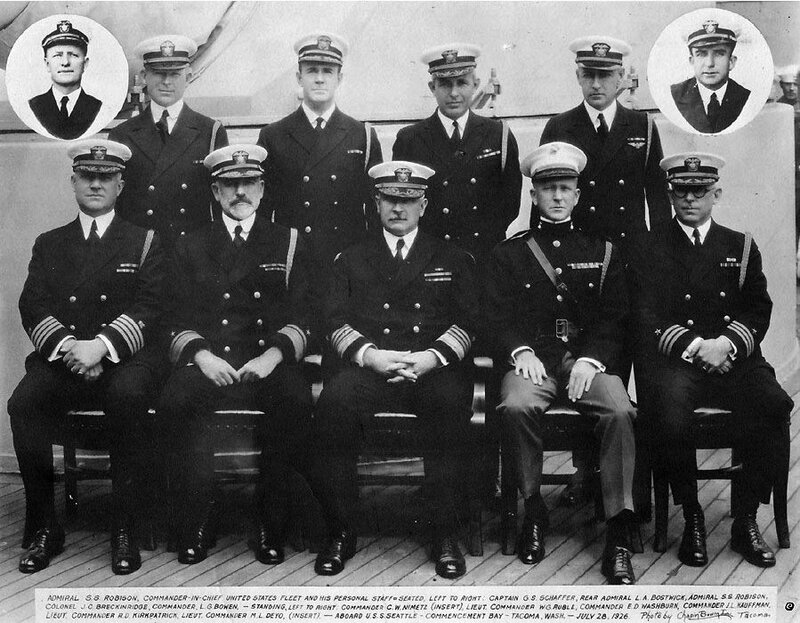 In October 1925, he moved to the even more prestigious position chief of staff to the Commander in Chief, United States Fleet. Radm. Bostwick became President of the Board of Inspection and Survey in October 1926. In May 1929, he became the Commander, Battleship Divisions, United States Fleet, which carried with it the temporary rank of vice admiral. On 01 JuIy 1930, he was assigned to the concurrent posts of Commandant, 4th Naval District, and Commandant, Philadelphia Navy Yard, and served in those assignments until his retirement on 01 March 1933. Rear Admiral Bostwick died in Washington on 14 January 1940 and was buried in Arlington National Cemetery. 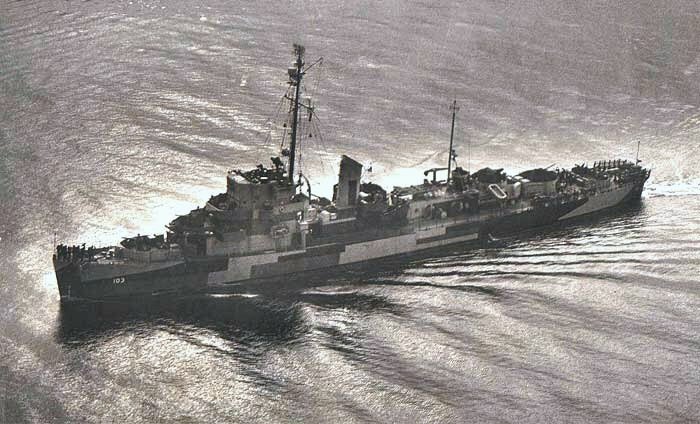 View the USS Bostwick (DE 103) DANFS history entry located on the Naval History and Heritage Command web site.